Wirelessly display content from your smartphone, tablet or Windows 8.1 laptop on your HDTV screen with the Belkin Miracast™ Video Adapter. Browse the Internet, stream movies and TV shows, or play games without staring at a tiny display. Access whatever content you have on your device, including photos, apps, and saved documents. Works with most Samsung Galaxy and Android iOS devices. Enjoy a full, rich picture on your HDTV screen as you watch movies or play games from your smartphone. Thanks to the adapter's 1080p resolution, you can view your mobile device content in high definition. Easily install your Miracast™ Video Adapter by plugging it into your HDTV's HDMI port. Plug the included USB cable into the Miracast and an available USB port on your HDTV. Follow the quick installation guide, and you're ready to view your smartphone content on your HDTV screen. The Miracast™ Video Adapter has a low-profile design so it stays hidden from view. It works wirelessly, so you don't have to worry about tripping over a long cable. The adapter's small size makes it easy to transport between home and the office. If your HDTV is mounted high on a wall or if the HDMI ports are difficult to reach, you may wish to run the included HDMI extension cable from the Miracast™ to the TV. This gives you the option of keeping the Miracast™ closer at hand, where you can easily unplug it and bring it to a friend's house. 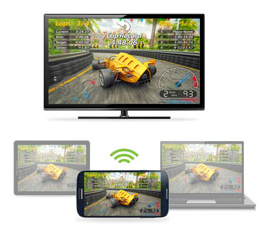 Miracast™ is natively supported from Android 4.2.X and above and on Windows 8.1, although support can vary per device. Some manufacturers built Miracast™ into earlier 4.1.X devices and Wi-Di into Windows 7 and 8 also. 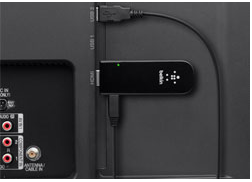 Check with your device manufacturer and the Belkin support pages for compatibility information.